President Donald Trump has ordered the stopping of aid to the Northern Triangle countries of Honduras, El Salvador, and Guatemala, after criticizing them for failing to stem the tide of their citizens traveling north and entering the United States illegally. Trump has mentioned stopping the aid several times since at least October and Secretary of State Mike Pompeo has now instructed the department to do so. About a million citizens of the three countries have been caught by Border Patrol between fiscal years 2013 and 2017 (pdf) trying to enter the United States illegally. American taxpayers gave the countries nearly $2.3 billion in aid in those years. Since 2017, the apprehensions of people crossing the border illegally has substantially increased—up from less than 416,000 in fiscal 2017 to over 521,000 last year. 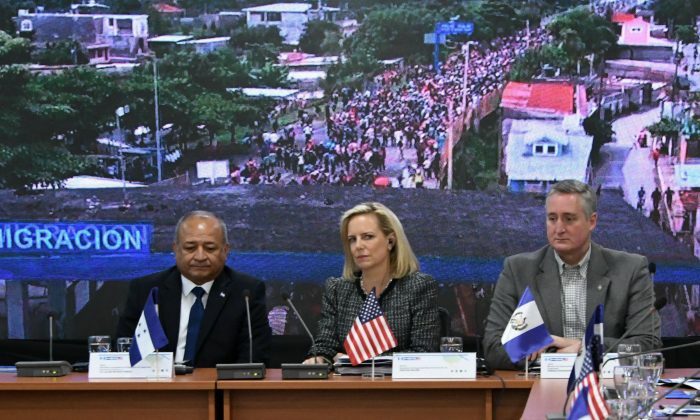 In fiscal 2019, the inflow is on pace to reach nearly a million illegal aliens, Homeland Security Secretary Kirstjen Nielsen said on March 6. The largest group of the migrants continues to be from the Northern Triangle. The United States has tried for years to aid the Central American countries in developing stable political and economic systems. Trump, however, appears to demand concrete steps to stop the migration now. “We were paying them tremendous amounts of money and we’re not paying them anymore because they haven’t done a thing for us,“ the president said. The White House referred inquiries about the aid to the State Department. Trump’s likely first warning of cutting the aid came in an Oct. 16 tweet, where he warned Honduran President Juan Orlando Hernandez that the aid to Tegucigalpa will stop unless a migrant caravan that had been traveling from Honduras north through Mexico was stopped and turned around. The caravan wasn’t stopped and eventually led to thousands of the migrants storming the border near San Ysidro, California, on Nov. 25. Some migrants were caught on video throwing rocks at border security officers and breaking through border barriers only to be repelled with tear gas and/or pepper spray. Indeed, more caravans have formed since, getting help from open border nonprofits and the United Nations. The Central American border crossers commonly surrender themselves to the Border Patrol and then request asylum, but only about one in 10 is ultimately found eligible to remain in the United States legally. Trump signed a national emergency declaration on Feb. 15 calling the southern border situation a crisis. The move enabled Trump to transfer funds from the Department of Defense toward constructing a wall on the southwest border. The White House so far has secured $8.1 billion toward border wall construction. Of the total, Congress approved $1.4 billion, while Trump ordered the reallocation $3.1 billion from the treasury and defense departments, and reallocated $3.6 billion from the military construction budget. The Pentagon authorized $1 billion for border wall construction on March 25. The funds are designated toward the construction of 57 miles of fencing in the Yuma and El Paso border sections. El Paso has seen a 500 percent surge in illegal alien apprehensions this fiscal year. Border patrol agents in El Paso caught more than 400 illegal aliens in the span of five minutes on March 19. The number of illegal aliens apprehended and turned away at the southwest border continued to climb in March to levels unseen for years. From December 30, 2018, to March 17, more than 23,000 illegal aliens were arrested or turned away at the border, more than double the total during each of the previous four years. With no space to house the overflow of illegal aliens, the Immigration and Customs Enforcement agency has released more than 100,000 illegal alien family members into the interior United States so far this year. Many are arriving in large groups at the border, a new trend. Epoch Times staff writer Ivan Pentchoukov contributed and Reuters contributed to this report.